A last minute rush to the ballot box delayed Gunnison County election results until late Wednesday, but it didn’t take that long to see the trend. Gunnison County is a blue dot in a red wave. Voters living in and around Crested Butte and Gunnison voted for Mark Udall for senate and John Hickenlooper for governor. We went for Joe Neguse for Colorado Secretary of State and Betsy Markey for state treasurer. It appears Hickenlooper will squeak by. Every other race went red. A few other things stood out in this year’s election, too. More than one person told me this week they were weirded out after receiving phone calls asking them to vote. In the past, representatives of the Democrats and the Republicans would take shifts with their voter lists and mark off the names of people who had voted. If your name wasn’t crossed off by, say, 4 o’clock on election day, you’d get a call from the party you most likely supported reminding you to get to the polls. With the mail ballot, the political parties mark their lists electronically each evening leading up to the election. That created an opportunity for a lot more calls. I voted last week and didn’t get any. Friends who waited to drop their ballots received several, and they found it intrusive and “creepy.” The vibe was too much Big Brother and not enough “Hey, neighbor.” The political parties should be aware of doing more harm than good and turning off those late voters as opposed to being encouraging. Speaking of Big Brother, outgoing U.S. Senator Udall worked hard to keep Big Brother out of our lives. He persistently challenged Obama and Bush and the NSA in an effort to protect your civil liberties. Perhaps that’s one thing he should have reminded voters about as he campaigned. Instead, he fell into the trap of over-focusing on women’s reproductive rights. When asked a few weeks ago by Crested Butte supporters why he was running those annoying ads, his response was essentially that the pollsters said it worked. It only worked to block out the really good attributes of a good, moderate Colorado senator. When strident supporters begin questioning campaign tactics, it might be time to be nimble and adjust the message. He could have talked about his effort to sound the alarm over the federal government’s tendency to walk on your constitutional rights. Udall also could have run ads defining the difference between his experience living in mountain towns like Crested Butte and his opponent’s experience on the eastern plains. Aspen Times columnist Paul Andersen pointed out this week that Cory Gardner “has a pitiful 4 percent rating from the League of Conservation Voters” and thus is more out of touch with things like the environment and climate change, which will impact the future of the mountains and our livelihoods. Udall understands that the environment in these parts means quality of life and economy. But instead he talked about the uterus. The Dems as a whole ran away from Barack Obama’s record and refused to take the obvious to the people. Every president has an approval ratings slump at the six-year mark. But during Obama’s tenure, the economy has expanded the last 60 months and stock market has set record highs. The unemployment rate has gone from over ten percent to under six percent. The deficit has shrunk dramatically. I understand that people’s lives still feel shaky and income inequality is a growing concern, but will the Republicans fix that or push more money in the Koch brother’s pockets? The Dems allowed the Republicans to define progress from a recession as failure. The cowardice of Democratic candidates in talking about real issues under Obama is what lost them respect and an election. I don’t understand the shock among their supporters. Now, Cory Gardner was saying some of the right things Wednesday morning about making government work again and uniting Colorado so let’s hope his view broadens and he will work for the needs of mountain communities like ours. Finally, a note on backcountry reality that has nothing to do with this election. 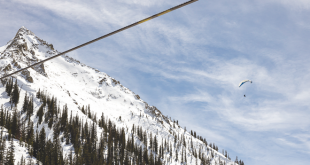 I heard the season’s first avalanche partially buried a few local skiers on Mt. Owen this week. 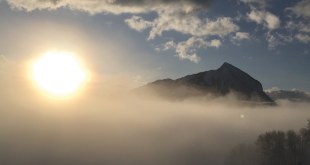 According to a post on the Crested Butte Avalanche Center’s Facebook page, the snow slid on the early October layer as the two skiers were boot hiking up Jenga Chute. 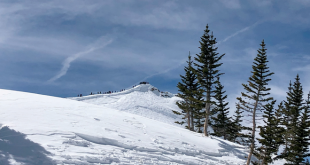 A two-foot crown on the early October crust swept them down, partially buried them and gave them, and all of us, a big wake-up to the start of the backcountry ski season. To carry a bad analogy over, a small white wave sent us all a warning about the coming winter. Be aware. Meanwhile, the big red electoral wave has let the blue dot of a county know that things are about to change. Be aware.